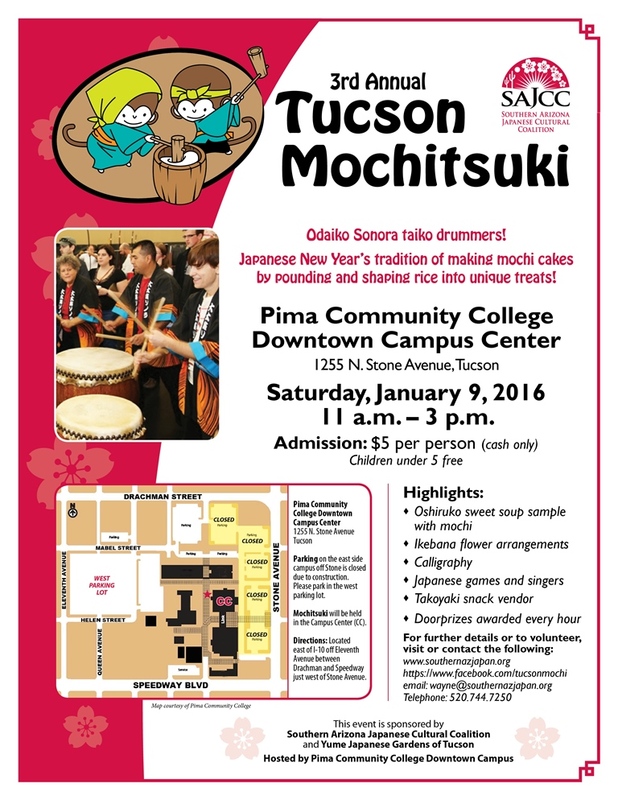 The Southern Arizona Japanese Cultural Coalition (SAJCC) invites the Tucson Community to the 3rd Annual Mochitsuki. Learn about Japanese New Year’s rice pounding tradition on Saturday, January 9, 2016 at Pima Community College Downtown campus, 1255 N. Stone Ave. at NW corner of Stone and Speedway. 11 AM to 3 PM. $5 adults & children under 5 free. Attendees should use the westside parking lots. There will be taiko drum performances by Odaiko Sonora, mochi rice pounding demonstrations, games & prizes, free mochi samples, along with other Japanese cultural activities such as Anime, calligraphy, origami, martial arts, kyudo (archery), singing, authentic Japanese Tea Ceremony, ikebana,and exhibitions from several Pima CC student groups. Please come and join us for a fun day. For further details, see SAJCC website www.southernazjapan.org and Tucson Mochitsuki Facebook page, www.facebook.com/tucsonmochi/. Phone contact: 520-744 -7250, email wayne@southernazjapan.org. This event is also sponsored by Yume Japanese Gardens of Tucson. 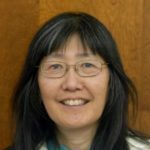 Carolyn’s note: I am the Editor of the SAJCC website, so for an article/photos of last year’s 2nd Annual event: https://blogforarizona.net/photo-gallery-of-2nd-annual-japanese-new-years-mochitsuki-celebration/. 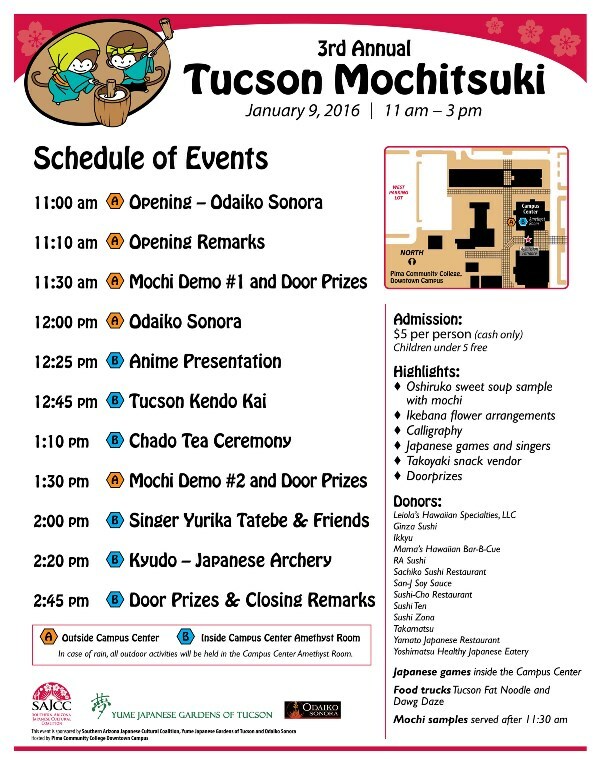 The first Tucson Mochitsuki event was held at Yume Japanese Gardens of Tucson. This event has grown in size and thus, the venue has changed. Next articleDucey: Prosperity Is Just Around The Corner! Over 500 people attended our 3rd Annual Mochi pounding event today and what a day of fun. For children upstairs: origami, igo, kendama and fukuwarai games. Food vendors were Fat Noodle truck, a takoyaki booth (octopus dumplings), 3 types of musubi made by Sky Island HS students of Japanese, Diversity Club snacks (mochi, arare, ame) and lots of tables — our SAJCC one, Japanese Assn. of Tucson, Shinsei ikebana, Yoshi Nakano & Akiko Victorson calligraphy, Wounded Tiger book, Kelly Rose adventures in Japan, Japanese Christian Church of Tucson, kendo, kyudo, mochi samples & tea and Yume Japanese Gardens. Wow, what a matsuri for New Year’s. Photos to come. I didn’t teach hanafuda card game this year, just had it on display at our table. And of course the mochi pounding, taiko drumming, anime, singing and tea ceremony demos on the stage.